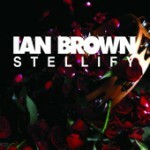 Ian Brown’s new E.P. has hit number 1 on the iTunes album chart. Stellify, a 4 track preview from his forthcoming album, has shot straight to number 1. Featuring the tracks Stellify, Crowning of the Poor, For the Glory and Marathon Man the new E.P. is a blinder.